Laura Hamilton is a specialist in volunteer involvement and volunteer management, with 18 years’ experience working in this field. Her background includes working for both volunteer involving and volunteer infrastructure organisations. She now works freelance; supporting organisations to develop and grow their volunteer programmes and designing and delivering training for volunteer managers. Take a fresh look at volunteer recruitment and how to make your opportunities attractive to a diverse range of volunteers. If you manage volunteers don’t miss out on this informative course which will help you to take a fresh look at volunteer recruitment and how to make your opportunities attractive to a diverse range of volunteers. We will explore how to build your profile, promote your volunteer roles and create an effective and safe recruitment process. 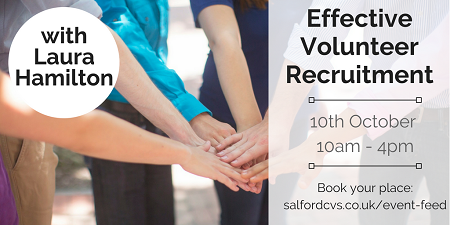 We will also discuss how to ensure your volunteer recruitment reflects your organisation's values and ethos.